Need a lively band for your 1920s prohibition era Christmas party? Want authentic music while you drink cocktails under the mistletoe and dance the foxtrot? Then read on…. Silk Street Jazz are proud to present The Jazz Spivs, a professional 1920s jazz band who are the perfect choice for your prohibition, Gatsby or 1920s themed Christmas party. Watch the roaring twenties come alive through the toe-tapping, razzle dazzle music of the Spivs, the 1920s party band to end all party bands! – Want to request a song? Inform us in good time and we’ll learn your favourite 1920s tune! – Need something a little extra? Let us bring our troupe of stunning 1920s Flapper dancers to give your Christmas party unforgettable pizazz. You won’t have to worry about your guests getting involved – whether they feel like throwing off their shoes or not, the flappers will guarantee a night of dancing! 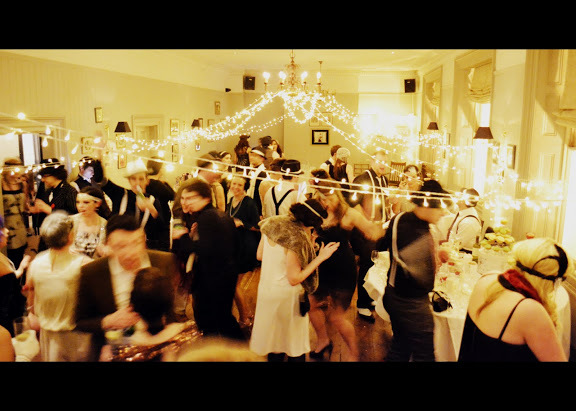 Get in touch with us to find out how we can help you throw the best 1920s prohibition era Christmas party ever. Call us on 0330 223 3912 or send us an enquiry form and we will be happy to discuss your needs. We look forward to hearing from you!